One of the most common complaints I hear from managers is “I don’t have enough time to do my work because I spend too much time in meetings”. Meetings are a funny thing, some people love them, some people hate them. Regardless of your stance I bet that the meetings you attend are the single biggest time thief. Like a swiss clock is reliable, you can rely on the average meeting starting late. By the time everyone is present and disruptive latecomers are “caught up” you could already be 15 minutes behind schedule. Meeting Deja Vu: is the feeling you get when you’re discussing a problem and you’re thinking “Didn’t we discuss this last week? And the week before that?” Discussing the same items over and over without proper resolution is like the spicy meal that just keeps on giving and giving. Between time wasted without a result and multiple repeated discussions a 15 minute agenda item could easily cost you 30 minutes (C2T). Meeting rabbit holes: Like Alice you end in a fantasy Wonderland where your time disappears magically and you end up wondering (sorry) why nothing got done. These off-topic “rambles through the countryside” could be another 15 minute diversion. Death by meeting ramblers: Those 10 minute monologues that only had 5 minutes of useful content. A few of those and you’ve just lost 15 minutes of your life that you will never get back. Ever had that “Why am I here?” feeling? Being in an hour meeting that you could’ve had a 5 minute update on instead? 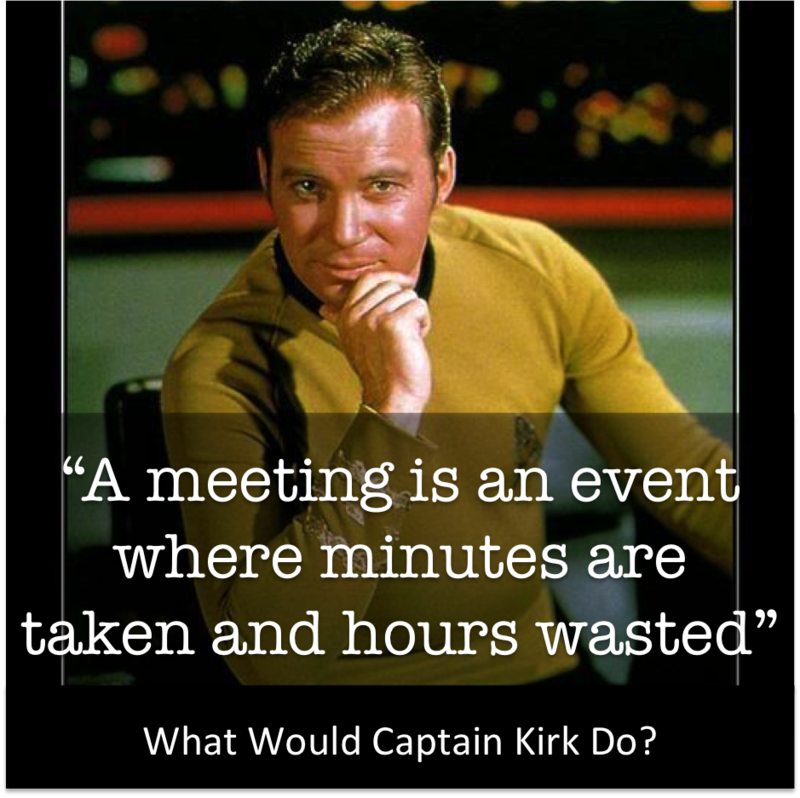 That wasted hour split across relevant meetings is around 5 minutes lost per meeting. “I’m only here for the biscuits.” That feeling of annoyance that someone ate all of your favourite meeting room biscuits and didn’t even contribute anything to the discussion. Time penalty: 5 minutes. “Could you repeat the question - I was too busy texting”. Having low quality meetings because people are trying to multi-task. Time penalty 5 minutes. The timetable fallacy - like travelling on the last flight of a budget airline and hoping that it will be on time. Delays throughout the day stack up like dominoes and you’ll be lucky if you have time for lunch. You definitely won’t finish everything you needed to before home time. Finishing late, lost productivity: 30 minutes. Final tally: A single disruptive meeting could eat 2 hours of your own personal time. So where does the other 8 hours come from to get to 10 wasted hours? The tea and biscuit budget is not the expensive part of a meeting. With 5 meeting participants 2 wasted hours wasted becomes 10. No wonder people hate meetings. You may think that an hour meeting is maximum an hour of your time but it’s a bit like buying a $10 razor that ends up costing you $100 in razor blades. Ok enough problems - how do you get your time back? The knee jerk reaction is to stop going to meetings (and being selective with where you spend your time will definitely help with your focus). But the thing is that there’s nothing inherently wrong with meetings themselves. For some purposes, meetings are simply the best tool for the job. If you look at all the above time thieves - none of them have got anything to do with meetings themselves, they are all because of the way that meetings are run. Stopping going to meetings is like trying to save money on razors by stopping shaving. I’m not sure what the solution to saving money on razor blades is but I do know that the way to save vast chunks of your working week is to get your time back from the time thieves. P.S - Meetings aren't the only time thieves. Do you find yourself working hard to cover up employee performance shortfalls? Being a boss is a tough job - you have the world on the shoulders. You are the super hero that keeps the lights on and the team together. That's why I've made the www.boss.camp program. It's support for super hero’s like you so you can get your team to do more of their jobs, leaving you time to do your own. Do you have any comments, questions or tips for making meetings more productive and efficient? Help the rest of us out by sharing in the comments below.